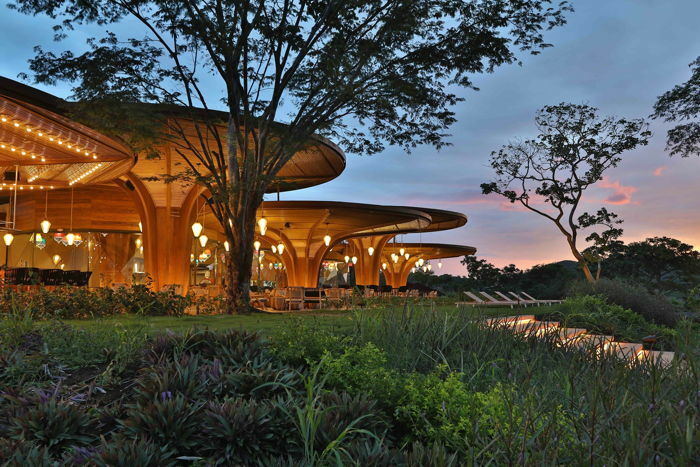 W Hotels Worldwide today announced the opening of W Costa Rica – Reserva Conchal, the first W hotel in the country. In addition to being the second W hotel to open in Central America this year (following W Panama), W Costa Rica is also the newest W Escape, the brand’s unique spin on the traditional resort experience – zip line and all. Upon arrival, guests are ushered through an avenue of 2,000 Bursera Simaruba trees (or “Indios Desnudos”), a living fence traditionally grown by local farmers to pen in livestock. The brand’s signature “W” sign is a negative space among a bright red wall that wraps around the Wheels area (valet). The circular arrival area and signature W sign is inspired by the unmistakable red of bull fighting that can still be found during one of the country’s emblematic cultural activities held at “Plaza de Toros.” Although true to the Pura Vida spirit, bulls in the Costa Rican bullfighting tradition are not killed. Zona Azul Beach Club is the brand’s first on-site beach club located on one of the country’s rare white sand beaches, Playa Conchal. W Costa Rica is giving guests a playfully social thrill – a soon-to-come zip line right from the hilltop Wet Deck to the surf side beach club. Talk about instant gratification. Guests can take the 10-minute stroll down to the shore, or opt in for a one-way ticket down to Zona Azul Beach Club.